Emma Cakes supply two tier, three tier, and four tier designer chocolate wedding cakes, individual cakes, cheesecakes, tarts and petit fours, for your big day. We offer you professional advice to create that special wedding cake for your most memorable occasion, incorporating your ideas and wishes. 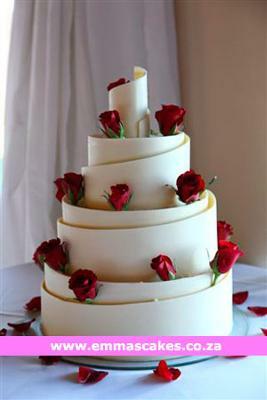 Your wedding cake will be unique, individually designed and decorated to your own specification and color scheme. Our wedding cakes, are created to the highest standard. Three complimentary individual chocolate band samples in the flavour of your choice available at every appointment.